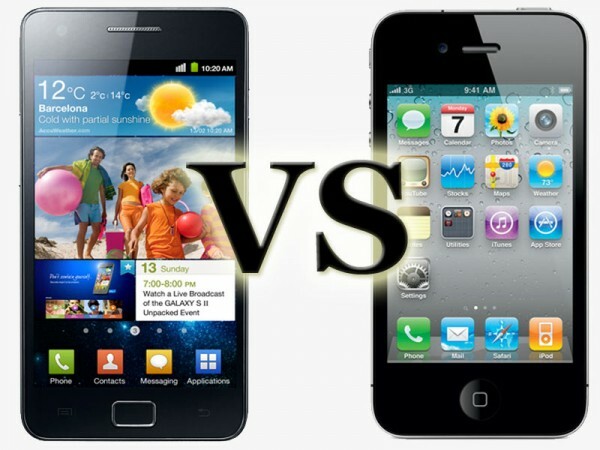 Is The iPhone 4S A Samsung Galaxy SII Killer? The CPU is the workhorse, the man behind the scenes powering everything your phone does. So typically it's the more the better. What'sÂ surprisingÂ about this comparison is that Samsung actually makes both of these CPU's! The CPU decides how fast you run apps, and how smoothly your video and gaming experience is. It's actually hard to decide between the two, both phones run silky smooth, video and gaming is top notch. Hard decision, but in the midst of a possible deadlock, we have to go with the bigger the better theory! RAM is all about running apps, specifically how many apps you can run at once. As android lets you have true mutlitasking of all apps, it makes sense that you might need more RAM. Because of all this RAM, the experience on the SGSII never degrades, regardless of how many apps are running concurrently. The iPhone needs less RAM because it doesnt support true multitasking, so although the RAM is lower, you typically still get a smooth experience. But, more RAM more running apps moreÂ productivity! We've all heard of the retina display haven't we. It's so smooth your eyes can't even tell it's a display (or something, it's hard to concentrate when they start going on about it). What's not in doubt is that the iPhone 4s display is beautiful, but what is in doubt in how big it needs to be. 3.5" justÂ isn'tÂ enough to enjoy pictures, films and games on your phone. The SGSII on the other hand, has a very handy near 4.3" screen using the fantastic Super AMOLED Plus technology. Although the resolution is smaller, which may make smaller text less clear than on an iPhone, the vibrancy of colours on the screen is just fantastic. Having a larger screen also means you can enjoy gaming and videos, not to mention pictures much more than on a smaller screen! If you can, I'd highly suggest getting an iPhone 4s and SGSII side by side, if you aren't more blown away by the Samsung offering I'd be extremelyÂ surprised. The camera specs are near identical on these two phones, as are the pictures they produce. For a smartphone camera, both produceÂ fantasticÂ images, well worthy of replacing a cheap compact. It's hard to pick between the two, and so this one goes down as a tie! The specs really speak for themselves... The SGSII is both thinner and lighter! Samsung managed this in part by using plastic for the casing over glass and metal as found in the iPhone. I highly recommend you hold one in your hand, it's easy to think cheap when the word plastic is used, but once you hold the SGSII in your hand, you'llÂ that'sÂ the farthest from the truth. The iPhone isn't a bad design it has to be said, it just looks slightly... well dated when side by side to the SGSII. And don't get me started on the build quality... There have been numerous drop tests done with these two phones, and the SGSII comes out the winner, usually by a long way. Not much to say here, the maximum storage you can get on the iPhone is 64GB, the maximum in total on the SGSII is 64GB (well unless you shell out for a 64GB microsd card!). So that should equal a tie right? Wrong! The SGSII has removable storage, which gives it a one up on the iPhones non-removable. This completely depends on user preference. That preference being if you like to be toldÂ what'sÂ best for you, or prefer to make that decision yourself. If you like being told what you can and cannot do, go ahead and grab the iPhone! But, if you prefer to make your own decisions, and have a phone you can truly make unique to your personality, android is definitely for you! Well, with the score currently atÂ Samsung 6:1 Apple, would you pay almost Â£100 more for the losing phone? No, me neither.